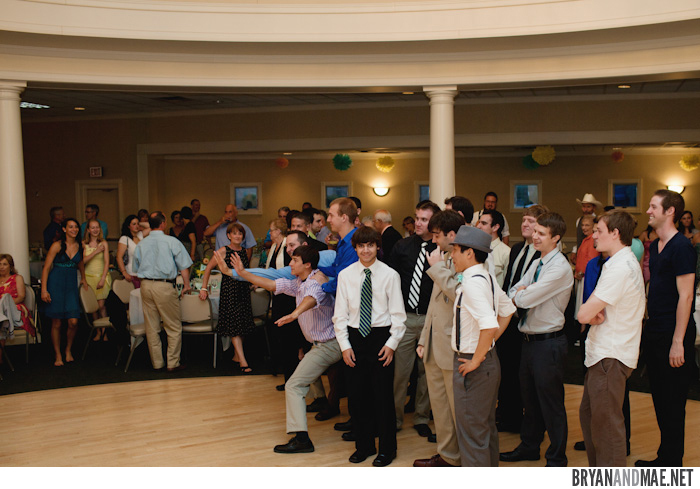 Before we could really get the dancing party started, we had a few more traditions to uphold. 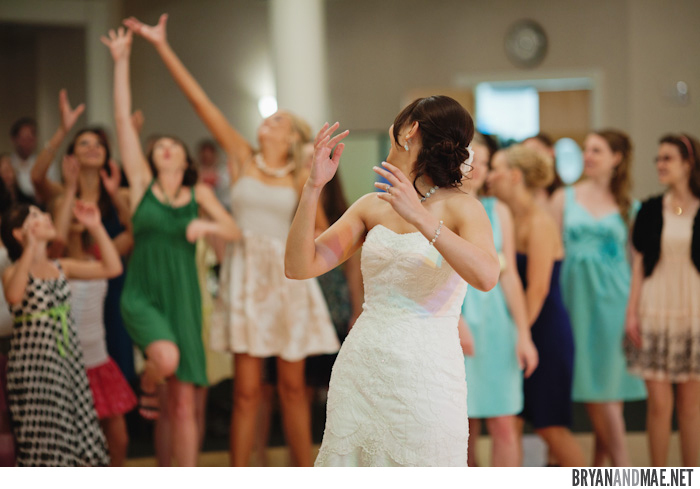 The bouquet toss, for one! I had DIY’d a little toss bouquet out of the silk flowers I had bought for centerpiece mock-ups using hot glue and spare ribbon the night before. 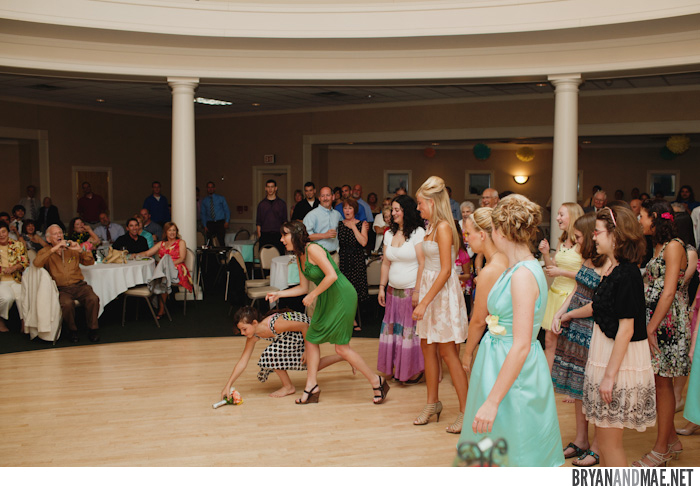 Brides, do not let yourself handle hot glue guns the night before your wedding. It just won’t lead to good things. I, for instance, was reckless in my stressed state of mind and ended up burning the tip of my finger on scalding glue. The burn promptly blistered before my eyes and there was nothing anyone could do. Fortunately, the blister was well-protected by my thick, shellacked nail, so it didn’t bother me throughout the wedding. But the experience made me even more eager to chuck that offending bouquet into a crowd of rabid women. That’ll teach it. 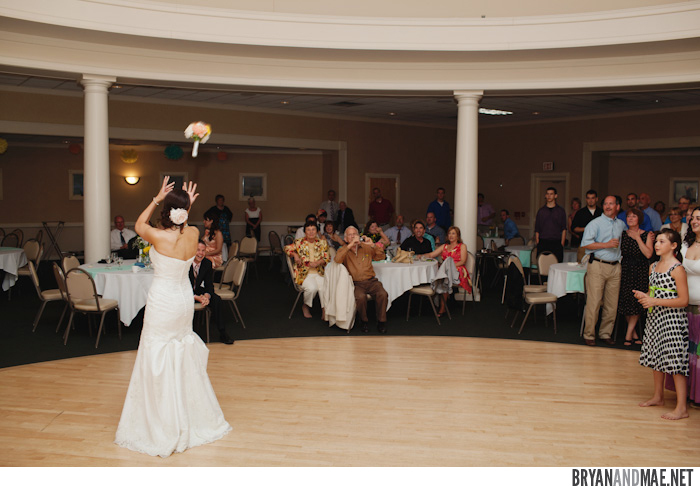 Alright, alright, so silk flowers can’t be taught lessons and the crowd of women were far from being rabid, but the toss was still fun! 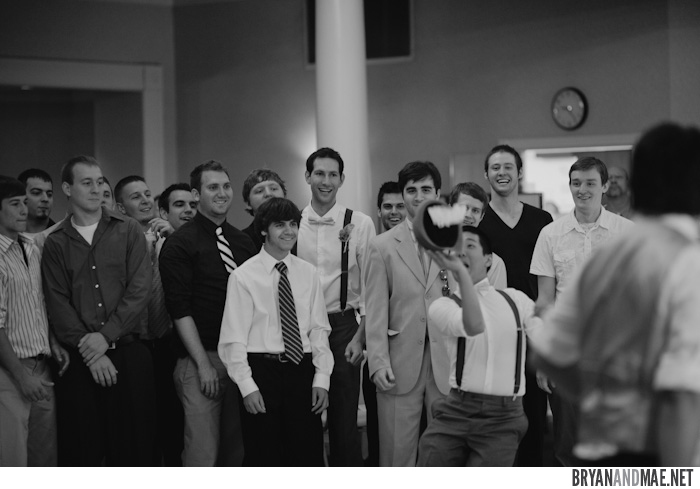 All single ladies, even the engaged, assembled behind me. I was secretly aiming for the woman in green, as you may notice. I was privvy to her boyfriend’s tentative plans and thought it’d be some good ol’ foreshadowing. She ALMOST got it! But she’s an absolute sweetheart, so she let my little cousin claim the prize. It hardly affected anything, though, as the lady in green is now in the midst of planning her wedding! 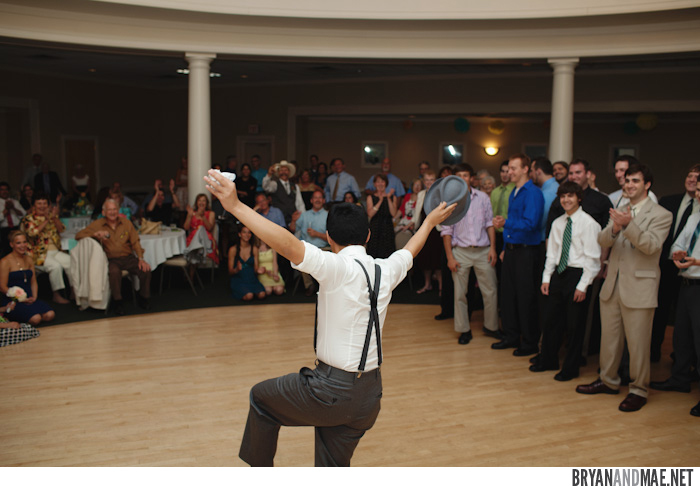 We nearly didn’t have a garter toss, but friends convinced me and I managed to convince Mr. Bunting and on the way home from an errand two days before the wedding, Mother Bunting and I picked up a $2 garter from a little bridal shop. $2 garters are not the most comfortable of garters (I speak like I am an experienced garter analyst), so that baby didn’t go on until it was ready to be removed. ..and then he got shy. I can’t blame him. What’s more awkward than sticking your head under your new wife’s dress to retrieve a flimsy undergarment from around her thigh while ALL of your friends and family and new in-laws look onward with glee. 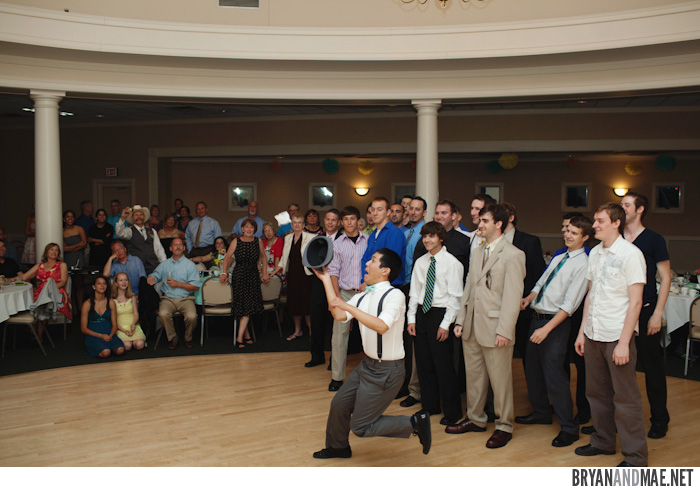 But once the garter had successfully been retrieved, the single men got serious. My cousins practiced their blocking positions and tested their arm’s lengths. Despite their best warm up efforts, no one actually wanted to dive for it. (They can’t appear desperate, these suave gentlemen!) That, or they knew they didn’t stand a chance against Bestman Bunting. Who caught it. In his hat. Like a boss. Yeah, you earned a victory dance. Yes, yes it did. 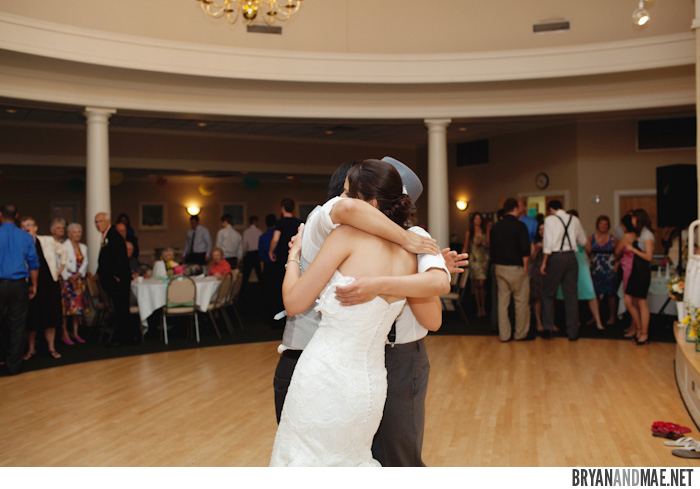 We congratulated Bestman Bunting with a good ol’ group hug. 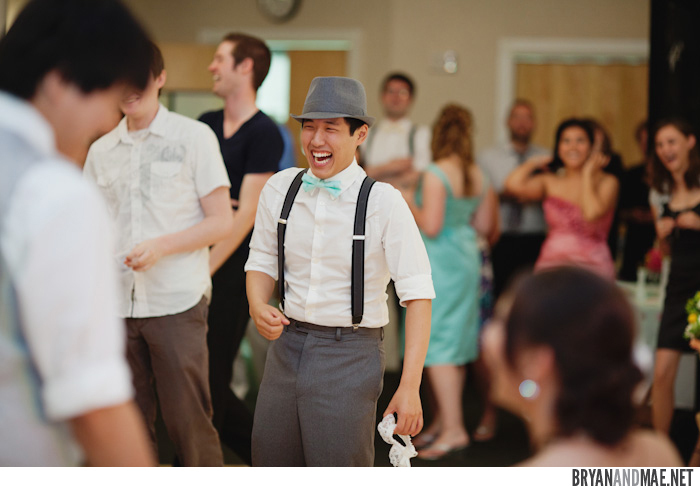 Next up, everyone puts on their dancing shoes! Which, for most women at weddings, really involves taking them off. *Marked photos are copyright Bryan and Mae Photography. Unmarked photos are personal or guest photos. We had a fluffing party and rehearsed. I woke up and got ready with my girls. I step into the prettiest white dress I’ll ever wear. Mr. Bunting recounts getting ready at the Man Cave. Wishin’ and prayin’ and hopin’ and thinkin’ for perfect weather. I received the most important Post-It Note. Ever. We race toward one another for our first look. Mushy-lovey photos ensued shortly after. We strutted our stuff as one big happy Bunting Bunch. Our guests started to arrive: welcome to our wedding. I went into hiding… and panicked. Our wedding party assembled on time, but the bride was missing. I arrive fashionably late in a horse-drawn carriage. We listen to a reading and turn to wave at our guests. 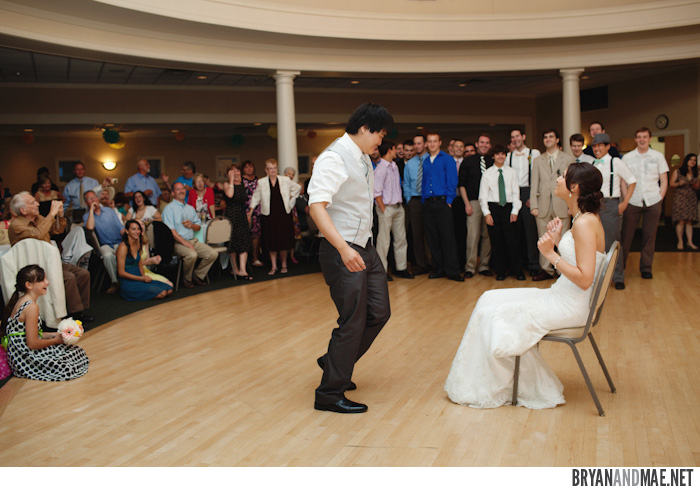 We exchange our vows, which inspire both tears and laughter. Mr. Bunting slips on my wedding band, and I his. Collected sand and earth offer a twist for our Foundation Ceremony. 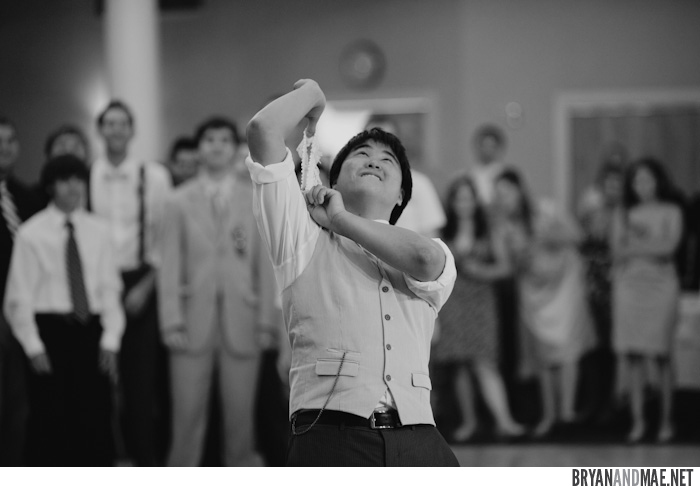 Mr. Bunting just can’t wait any longer to kiss his bride! Our horse-drawn carriage takes us for a private stroll. Cookies were had by all, and they were as delicious as they were beautiful. 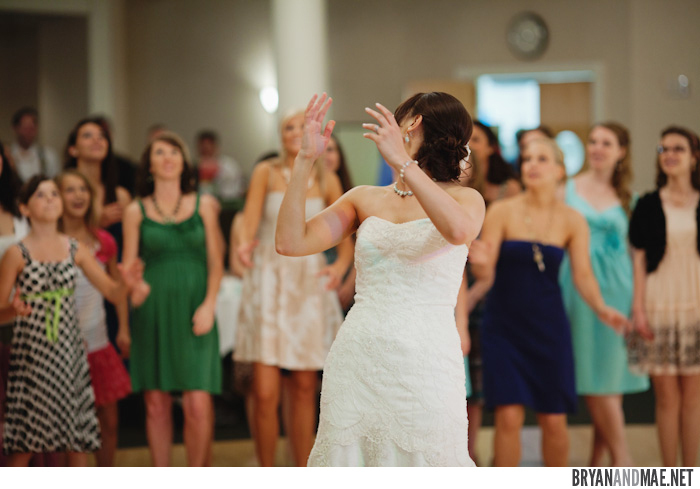 Spontaneity hits and we throw all our poms into the air. Oh, and at each other. Our reception hall is filled to the brim with details, details, and more details! Our party marches in to the tune of Star Wars. Unsurprisingly, there’s more kissing! This time our guests get involved. A slideshow chronicles the story of our romance. 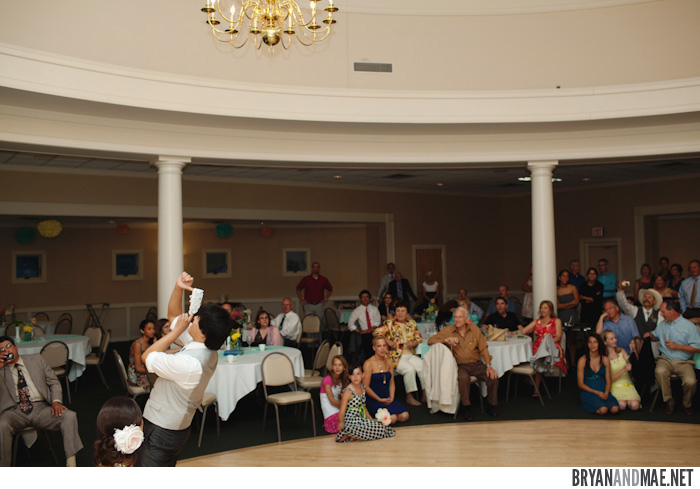 We uphold the tradition of the first dance, daddy-daughter dance, and mother-groom dance.